When Tendai Chatara hit Adnan Akmal on the knee roll to strike for Zimbabwe early on the final morning, he ran to fine leg to celebrate. Somewhat bewildered, his team-mates followed. For each of the two wickets he claimed afterwards, they did the same thing. The area of the ground they enjoyed their successes in was not near the supporters’ club stand or the main building. In fact, there were hardly any people there at all. So, what was so special about it that the entire team congregated there as they approached victory, Brendan Taylor was asked after their thrilling 24-run win over Pakistan in the second Test. “I don’t know, you’ll have to ask Tendai,” he said. Andy Waller concurred, adding that he too didn’t know why the wicket-taking glee was on the opposite end of the ground from the change room. The question was asked and Chatara, a shy 22-year-old overawed by media attention, just laughed. “I also don’t know,” he said. It turns out the place he ran towards on instinct is the direction of his hometown, Mutare. “The ghetto,” he called it, when talking much more seriously about how a small-town man felt on making it on the international stage. “Coming from the ghetto to here… it just feels nice to contribute,” he said. A few years ago, the chances of Zimbabwe finding someone like Chatara would have been slim. He is not from one of the main cricket centres – Harare or Bulawayo – does not have the same advantage of going to a traditional cricket school and was considered a “raw talent” until very recently. That Zimbabwe Cricket unearthed and nurtured him and that he put in a match-defining performance, picking up his maiden five-wicket haul, is testament to how the game has changed and even progressed in the years since Zimbabwe last beat a top team. Victory against an opposition other than Bangladesh last came 12 years ago, when Zimbabwe beat India at the same venue. The team that played then and the circumstances they played in are completely different to the one who took the field this time. In 2001, salaries were being paid, the game had yet to undergo the efforts to make it more accessible to the majority and the country was still relatively stable. 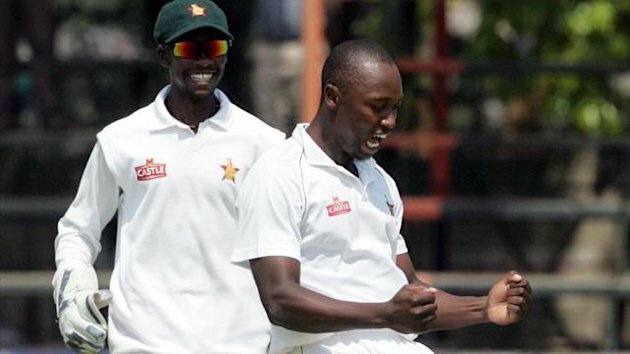 Fast-forward to the present and Zimbabwe and its cricket have been through significant change. Economic crisis and dollarisation has taken the economy from difficult times to a new kind of security, which has still left many ordinary people struggling to keep up with increased prices. The white-player walkout, transformation and a self-imposed exile from Test cricket left the game in tatters and triggered its slow and painful recovery. Success on their Test comeback in 2011 after six years in exile was quickly overshadowed by five straight defeats in the longest format. The construction towards a competitive team seemed to have unraveled with crushing defeats at the World Twenty20 last year and the ODI series against India. The very fabric of the game itself seemed to have worn thin because of the financial difficulty Zimbabwe Cricket found itself in. The first signs of money problems were brought to the world’s attention through Tatenda Taibu on the Test comeback. The since-retired wicket-keeper said “nothing had changed” in terms of unkept promises. They mounted up more steadily recently. Heath Streak was laid off as bowling coach ahead of the April series against Bangladesh because of a financial concern. And the players who were not centrally contracted wanted to strike because the winter contracts they were being offered were not considered adequate. ZC reached an agreement with everyone except Craig Ervine, who opted for club cricket in Ireland. Matters ballooned before this series. Having not seen their July or August salaries, the players formed a union, for the first time in decade and threatened to boycott first the whole tour, then the third ODI, then the Tests, unless paid. Each time, they extended their deadline and eventually ZC showed them the money, at the expense of some staff. Still, they lost Kyle Jarvis to premature retirement and Graeme Cremer and Sean Williams, who did not want to play unless paid. Williams has since committed to Zimbabwean cricket. But if you were at Harare Sports Club (HSC) on Saturday afternoon and you did not know any of this, you could not have suspected it. What you would have seen were a triumphant group of players, tumbling over each other as though there was not a care in the world. At the heart of that, you would have seen Chatara. The man with a five-wicket haul in his fourth Test, surrounded by team-mates, many of whom would not have had the opportunity to play for Zimbabwe before because underlying prejudices would have kept them out. You would also have seen Taylor, the captain who a decade ago decided not to join his compatriots in a walk-out because he was “too young to understand or want to get involved in the politics,” and because he wanted to play international cricket. Taylor’s desire to compete at the highest level is what has kept him in Zimbabwe despite offers from afar like one rumoured to have come from Hampshire. “This is the ultimate,” he has said in previous interviews. This time, it really was. Two of Zimbabwe’s most loyal cricket supporters are a fifty-something year-old white man called Neil and a black man of about half his age, Eddie. Neil has been coming to matches at HSC for as long as many can remember. He does not miss a ball. Neither does Eddie, who travels from his home more than 200 kilometres away for matches in the capital. Often, especially early in the morning, they are the only two supporters in the ground. The largely empty stands have led some to believe cricket is not a popular or marketable game in Zimbabwe. Others think the ticket prices are too steep but at US$2 all ZC can do is open the gates for free – which may not be the worst idea – if any reduction is sought. The truth is that just like elsewhere in the world, Test cricket attendances are dwindling because people have other commitments. That does not mean they aren’t following in some way. As the day grows longer and some of them have hours to spare, they start filtering in. One of the open stands is occupied by the supporters’ club – a vociferous group who break out into popular songs, which those who know Zimbabwean cricket will recognise. Attention, accompanied by saluting to attention as a soldier does, is one of them. One more, one more chanted when someone is a run or wicket away from a milestone, is another. One more made only a brief appearance in this match, after Zimbabwe took the ninth wicket and before the last man was run out. When that happened, there was only joy. The players’ huddle, Shingi Masakadza charging down the stairs with the Zimbabwean flag in hand and groups of people who were in the ground celebrating would be some of the lasting image of this win. Afterwards, Eddie waited for the post-match press conferences to end so he could congratulate his team. Neil seemed to have already left. No doubt he would have been overjoyed. He had said, on all the previous days that he wanted nothing more than a Zimbabwean win, especially because he had persisted in coming to support them through everything. The team did a quiet victory lap of the ground, waving and taking photographs with those who remained. They began with the groundstaff, who the umpires had applauded for getting the pitch Test quality in just two and a half days and who often go unnoticed and underpaid despite the hours they put in. In Zimbabwe, cricket is small enough to be about the people who may not command any attention at all in other places. Those who rolled the pitch and cut the grass were among the first to be thanked and to join in the festivities. A fines meeting, a party at the Centurion and all the usual revelries followed.